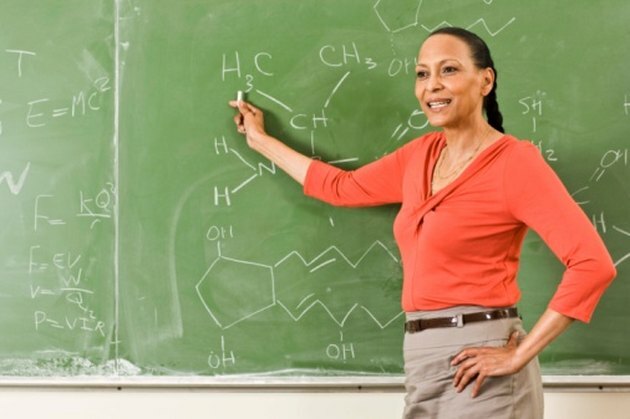 A common sight in many classrooms, chalkboards are a smooth and reusable black, gray or greenish surface that requires the use of chalk. Even though durable chalkboards will last for years, ink and paint can still cause damage and stains. When paint comes in contact with the chalkboard, it is best to wipe the wet paint off with damp paper towels. Once the paint dries, removal becomes more difficult but not impossible. Chalkboards are an important teaching tool in many classrooms. Spray a water-displacing spray on a clean, white cloth. Rub the paint with the cloth for several seconds. If needed, reapply the spray to the cloth and continue rubbing until the paint is no longer visible. Alternatively, apply the spray directly to the paint splatter and rub in a circular motion with a cloth until you have removed the paint. Pour 1/3 cup of acetone-containing nail polish remover into a small container. Dip a sponge in the acetone and rub the paint in a back-and-forth motion until it is no longer visible. Wipe the acetone off the chalkboard with a cloth damp with cool water. Dampen a cloth with rubbing alcohol, and scrub the paint off the chalkboard. Scrub vigorously and--when the cloth becomes soiled or dry--reapply the rubbing alcohol and continue scrubbing. Wipe the rubbing alcohol residue off the chalkboard with a damp cloth.